These dry out notes are finer and more complex than other Cinnamons. This is TOS's best steam distilled Cinnamon Bark. However, the Indonesian variety and Indian CO2 extractions are favored by some customers for blending. The CO2, for instance, is thought to resemble dry cinnamon spice and has excellent characteristic notes. Anti-inflammatory, powerfully antibacterial, antiviral, antifungal, anticoagulant, circulatory stimulant, stomach protectant (ulcers), antiparasitic (worms). Use cinnamon bark for cardiovascular disease, infectious diseases, viral infections (Herpes, etc.) digestive complaints, ulcers and warts. A biblical oil. Dilute 1:4 with carrier oil (1 part Cinnamon Bark oil to 4 parts carrier oil). Caution: Avoid during pregnancy. Certified organic. The main components in Madagascar's Cinnamon Bark Oil are Cinnamic Aldehyde, Eugenol, aceteugenol and trace amounts of other aldehydes. The amount of aceteugenol may be determined by the method of distillation. Steam distillation will decompose most of the aceteugenol. Water distillation is less detrimental to the natural aromatics in the bark. Cinnamon Bark Oil is used in flavors for food and candy, baked goods, and beverages. It boast hundreds of uses and is considered one of the best and most powerful natural antiseptics. In perfumery it blends well with woody oriental arrangements. The warm, dry, and spicy character work well with Citrus and Frankincense. Be cautious buying Cinnamon Bark. If the price is too good to be true then pass by it. Safety: Skin and mucous membrane irritant. Dilution required! 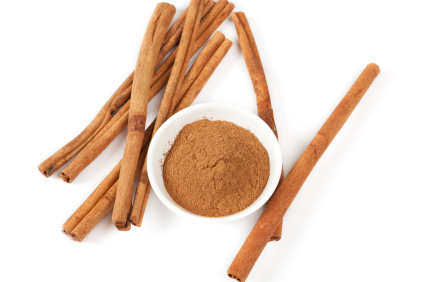 CAUTION: Cinnamon Bark essential oil can be irritating to the skin and mucous membranes - particularly in large doses. It should always be used in dilution. Medicinal Properties: Anti-microbial, Anti-infectious, Antibacterial for large spectrum of infection, Antiseptic, Anti-inflammatory, Antiviral, Antifungal, Anticoagulant, Antidepressant and Emotional stimulant. Traditional Uses: Fungal infections (Candida), General tonic, Increases blood flow when previously restricted. Good for digestive system, Calms spasms, colitis, flatulence, diarrhea and nausea. Helps control diabetes and high blood pressure. Eases muscular spasms, painful rheumatic joints as well as general aches and pains. It also affects the libido and is known as an aphrodisiac. Other Uses: Bronchitis, diarrhea, indigestion, and depression. It may help with asthma, athlete’s foot, Candida, coughs, digestion, fungal infection, mental clarity. Application: Dilute 1 part essential oil with 4 parts carrier oil and apply one to two drops on location; Diffuse or Massage. Caution: This oil may be a potent skin irritant (skin may redden or burn) , so be sure to dilute with carrier oil. May irritate the nasal membranes if inhaled directly from diffuser or bottle, so use with extreme care. Avoid during pregnancy.